#HashtagActivism – a new wave of digital activism? It is fascinating how one symbol or sign formerly used for programming language becomes an essential part of our vernacular. Though Twitter didn’t invent hashtag, it undoubtedly made it so popular that many millennials don’t even know its origin. The most successful digital activism to date has been #IceBucketChallenge, that produced unprecedented support globally. Rather than just hashtags, ALS Ice Bucket challenge mixed videos and mentions/tags on Facebook. So, from IceBucketChallenge to Occupy Wall Street Protests, hashtag activism has drawn so much attention and completely changed how people are mobilised to take part in a social or political movement. But how effective is hashtag activism in changing the society at all? To what extent is hashtag activism powerful? Whether if hashtag activism leads to a success is an extremely complicated question. Unlike campaigns like #icebucketchallenge that raised tens of millions of dollars for ALS research, other cases are often more complex to assess. #OccupyWallStreet was one of the first prominent hashtag campaign which then turned into a real protest. ‘Decentralised and leaderless’, as Reuters call it, has successfully mobilised thousands of protesters around the globe via the Internet – mostly through Twitter. Started from a local level, it soon started to spread across the US and worldwide. From #OccupyBoston to #OccupyLSX, people used Twitter, Facebook and Vibe to circulate the message and expanded the movement. The movements were believed to raise as much as $300,000 in donations to cover everything from pizza to video equipment but others put the figure much lower. #blacklivesmatter ‘movement called for an end to police brutality and the killings of African-Americans in the U.S’. The hashtag started gaining more traction in 2014 after the shooting in Ferguson which had more than 13,000 tweets in only an hour. #blacklivesmatter went viral by addressing the larger problem of systemic racism and police brutality. Did that pan out? Not to mention that young activists stormed to streets of major US cities, it certainly made politicians and celebrities debating. ‘In 2015, Black Lives Matter blossomed from a protest cry into a genuine political force. Groups that embraced the slogan hounded police chiefs from their jobs, won landmark prosecutions and turned college campuses into cauldrons of social ferment’, as Time Magazine praised. Just like #OccupyWallStreet, this campaign also ‘is anchored in the physical occupation of public space and amplified by social media’. #BringBackOurGirls, unlike the previous two campaigns, had only managed to raise awareness among the public. Yes, the hashtag earned the involvement of the first lady Michelle Obama along with 2 million retweets. It certainly brought the issue of Boko Haram militants’ kidnapping of hundreds of schoolgirls to the mainstream media globally. Regardless of the global attention and international aid to Nigeria in an effort to help with negotiations, those 230 kidnapped girls have not yet reunited with their families. 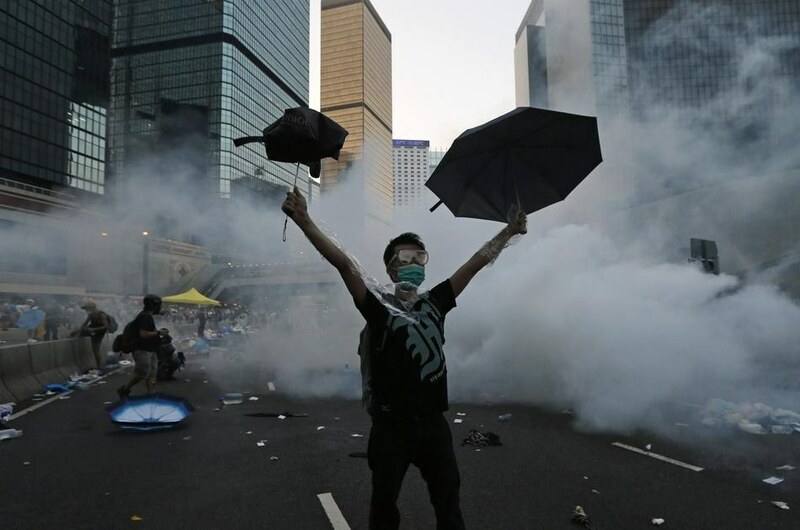 #UmbrellaRevolution was much less talked about by the western media. However, this Hong-Kong based protest for the free election systems managed to get widespread support from Twitter, Instagram and Facebook. Despite the mass arrest, young people took on the main street with a massive, organised occupation of governmental buildings. Thanks to protesters efforts, it quickly became the top trending hashtag and the poll showed that 59 percent of residents supported the movement. Each movement mentioned has long-term goals, whose process will take much longer time to achieve. While mainstream media often portray hashtag activism as useless and short-lived, they also signify the rising number of decentralised, leaderless grassroots movements (like #blacklivesmatter and #occupywallstreet). Twitter has clearly helped mobilise and connect global community of protesters via live-tweeting, live feedback and so on. But most of all, it has certainly empowered the marginalised. Twitter is not just a tool but also a proof for them. While most of us would agree that raising awareness wouldn’t be enough, Twitter and the likes provide a kind of proof of their stories and existence, which otherwise wouldn’t have been picked up by media. Here’s another controversy: is Hashtag Activism just a fancy word for activism for the lazy generation? As Evgeny Morozov has argued, tweets or retweets don’t always translate into effective campaigns. In fact, some suggest that the act of ‘Like’-ing or retweeting a hashtag gives a sense that they’ve done their part to support the movement. That really leaves us with the question of ‘what determines a successful campaign?’. If that is about global participation on particular issues, then #bringbackourgirls can be considered as a success. Or is success measured by tangible changes? We need to admit the illusion of digital activism, as hashtags alone won’t bring about the real change. Hashtag activism needs to be followed by further actions. And it is incredibly hard to measure the causal relation. Despite such controversies, few of us actually would be skeptical of the role of social media as the new tool of activism. The definition of success may differ according to each campaign – some may target a specific legislation, while others look at a big picture. What we’re really certain is that hashtag activism is here to stay.